Get yourself a room and a kayak. Daily paddles, coaching and socials in the evening. 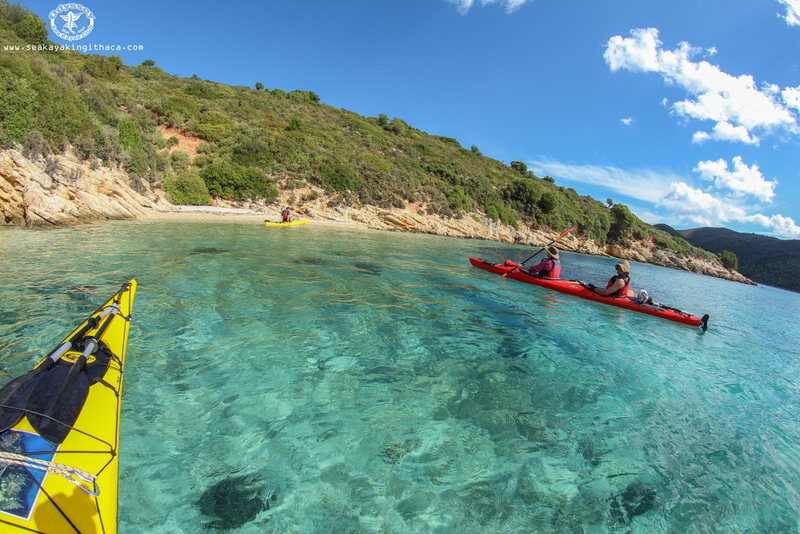 Sea kayaking in Greece - for beginner and experienced paddlers. We have created this option to give you the flexibility to take a paddling break whenever you like and choosing one of our 3, 4 or 7 nights packages. With this option you can enjoy a sea kayaking holiday on the dates that suit you. 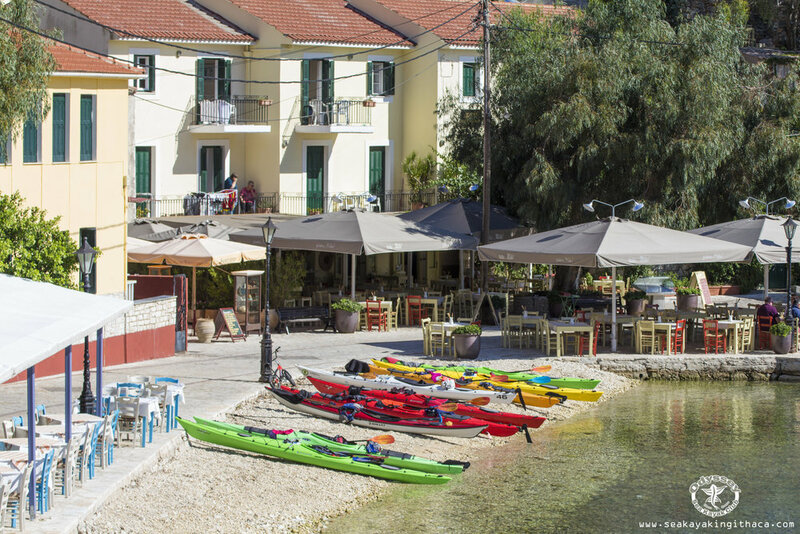 We will get you accommodation in the island and take you out kayaking every day to practice skills, enjoy the sea and relax in this gorgeous environment. Every package includes single room accommodation, guide/coach, kayak transfers when applicable and picnic lunch. If you are coming with a friend and would like to share a room, we can make you a discount. If you prefer a room with cooking facilities we can arrange that too. If you would like to stay for extra days, we can arrange any length of stay with a custom made package. ** WE OFFER DISCOUNTS FOR GROUPS OF 4 OR MORE IN ALL PACKAGES. If you would like to have a kayaking free day or are coming with a non-kayaking partner or friend, there are lots of other activities which we can also provide such as diving, jeep safaris, island and historical tours, motor boat hire and hikes. 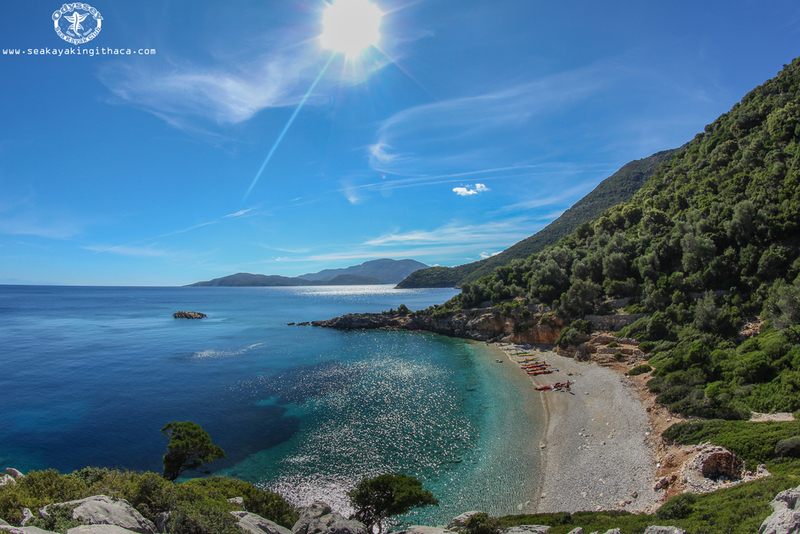 Ithaca is located next to the island of Kefalonia which has an international airport. From there, you will need to make your way to the port of Sami, take the ferry to Ithaca and then there is a short taxi journey to Vathi where you will be based. We can do all the taxi bookings for you and you can buy your ferry ticket in Sami. It is really easy and quick. If there are other visitors, we will group you to keep your transfer costs down. The island is small and gets booked up very quickly during the summer months. Therefore, if you are considering visiting in July or August, it is recommended that you make your booking by April. You will have to get your own flight, taxis and cover your expenses such as taverna meals (Budget around €10 for breakfast and €20 for a good meal. A beer or a speciality coffee costs €3). As part of our program you can join us in picking plastic from the sea and the beaches. Early in the season, we organise beach clean ups. We document what we find with the aim to reduce the use of those objects in the island. An example of this are plastic drinking straws. Our aim is to remove as much plastic from the environment as we can from our kayaks and if we can change attitudes towards the use of certain materials, even better. We also work with local people wherever possible to ensure that the community benefits from the business we bring. We have also organised training and development courses for local guides.